PLEASE NOTE: The Saunders Waterford watercolour boards will be gradually replaced by Langton Prestige watercolour board as the supply of the Saunders Waterford boards run out. At the moment the HP and NOT are Langton Prestige but the Rough is still Saunders Waterford while stocks last. Saunders Waterford mould made watercolour paper, 100% rag and acid free. Perfect for repeated wash work. The board is approx. 2mm thick. Size 30" x 21.5" (Full Imperial). 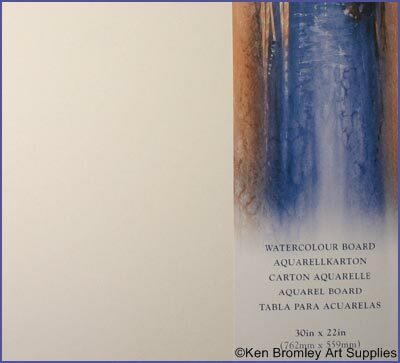 The watercolour boards can be supplied in the full size sheet or cut into half or quarter. Please select when ordering below. Minimum order is for 5 watercolour boards, which can any combination of surfaces.